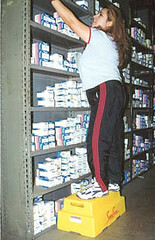 Using safe step stools in a warehouse to reach the higher shelves might just save your company from be sued by an employee. Employees sometimes take the easiest and fastest course of action to reach products on higher shelves when filling an order or getting stock for the office. 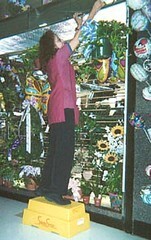 They will sometimes stand on the lower shelves to lift themselves up to the higher shelves. You can see evidence of this behavior if you look at the lower shelves. 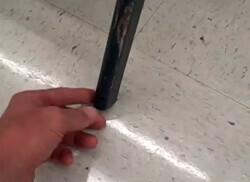 If you see a shelf that is bent or bowed in the center, and it’s the first or second shelf from the ground, chances are someone has stood on that shelf to cause it to bend. That also means that an accident was only moments away, followed by the inevitable lawsuit that accompanies accidents. Your employee was only trying to do their job and a suitable safe step stool was no where to be found. You get to pay higher insurance premiums and your employee while they recover. Not to mention, now you have to train a new employee to do the injured employees job! OUCH!! Which type of step should you use in a warehouse? A ladder? A rolling step? A folding step stool? 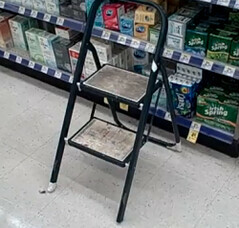 A 2 or 3 step ladder will work OK if your employees don’t weigh too much or try to reach across too far. The ladder will fold for storage which is a plus. 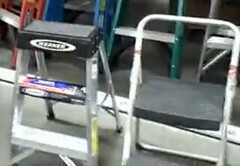 The biggest problem with a ladder is the width of the rungs that your employee stands on is only about 4 inches wide. Not really wide enough to have sure footing. Be sure to check the load rating of the ladder and add your employee’s weight plus the heaviest item they may have to pick up. If that total weight is close to the load rating you probably want to find a more suitable step. 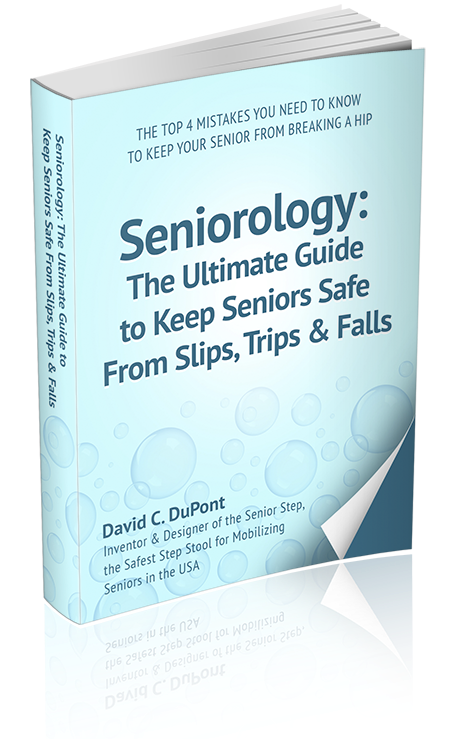 A rolling step stool will speed up your employees work if they’re stocking shelves like in a grocery store where a lot of stocking is being done on a long high shelf. The draw back to a rolling step stool is weight. 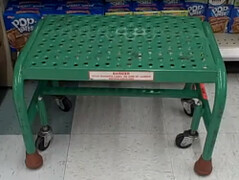 If your employee doesn’t weigh enough to compress the spring loaded wheels, the rolling step stool may slide out from under them. A folding step stool will also store easily when not in use. But these step stools rarely have a load rating that will support a person reaching and carrying a case of paper or something similar. The other problem with folding step stools is the legs, in particular the rubber non-slip pads on the bottom of the legs. These pads wear out and then the metal legs will slide on the smooth concrete floor. So to insure safety in your warehouse you should consider the load rating of your step stool, look for a step stool with no legs if possible and avoid rolling and/or folding step stools. David C. DuPont is an inventor of the ShureStep’s step stool based from his own experience of unwanted fall due to faulty crate he was standing on. That’s why he had worked on his “award winning” and “quality guaranteed” safe step stool not just for people like him, but for all of us and for all ages as well. From your active little kids to your beloved seniors. You can choose from his different types of step stool on his site www.Shure-Step.com.